This article is about the self-declared state. For other uses, see Somaliland (disambiguation).
" There is no god but God; Muhammad is the Messenger of God"
Since then, the territory has been governed by democratically elected governments that seek international recognition as the Government of the Republic of Somaliland ( Somali: Dowlada Jamhuuriyadda Somaliland, Arabic: جمهورية صوماليلاند‎ Dawlat Jumhūrīyat Ṣūmālīlānd). The central government maintains informal ties with some foreign governments, who have sent delegations to Hargeisa. Ethiopia also maintains a trade office in the region. However, Somaliland's self-proclaimed independence remains unrecognised by any country or international organisation. It is a member of the Unrepresented Nations and Peoples Organization, an advocacy group whose members consist of indigenous peoples, minorities and unrecognised or occupied territories. See the History of Somalia article for historical information. 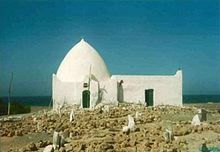 The tomb of Sheikh Isaaq, the founding father of the Isaaq clan, in Maydh, Sanaag. Ruins of the Adal Sultanate in Zeila, Awdal. British Somaliland Protectorate stamp featuring the tomb of Sheikh Isaaq at Mait. Women's market in Hargeisa, British Somaliland protectorate. In the early modern period, successor states to the Adal Sultanate and Ajuran Sultanate began to flourish in Somalia. These included the Warsangali Sultanate. 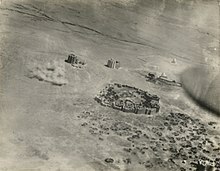 Aerial bombardment of Dervish forts in Taleh. Italian conquest of British Somaliland, August 1940. Location of the State of Somaliland, the former British Somaliland protectorate. Approximate extent of Greater Somalia including the territory of the Somali Republic. Exhumed skeletal remains of victims of the Isaaq genocide found from a mass grave site located in Berbera, Somaliland. War-damaged houses in Hargeisa, a capital of Somaliland (1991). The Executive is led by an elected president, whose government includes a vice-president and a Council of Ministers. The Council of Ministers, who are responsible for the normal running of government, are nominated by the President and approved by the Parliament's House of Representatives. The President must approve bills passed by the Parliament before they come into effect. Presidential elections are confirmed by the National Elections Commission. The President can serve a maximum of two five-year terms. Women in the Somaliland, wearing the colors of the Somaliland flag, prior to parliamentary elections in 2005. House of Representatives (Lower House) of the Somaliland Parliament. Somaliland is situated in northwestern Somalia. It lies between the 08°00' – 11°30' parallel north of the equator and between 42°30' – 49°00' meridian east of Greenwich. It is bordered by Djibouti to the west, Ethiopia to the south, and the Puntland region of Somalia to the east. Somaliland has a 740 kilometres (460 mi) coastline with the majority lying along the Gulf of Aden. In terms of landmass, Somaliland's territory is comparable to that of Uruguay, with an area of 176,120 km2 (68,000 sq mi). Somaliland's climate is a mixture of wet and dry conditions. The northern part of the region is hilly, and in many places the altitude ranges between 900 and 2,100 metres (3,000 and 6,900 ft) above sea level. The Awdal, Sahil and Maroodi Jeex (Woqooyi Galbeed) regions are fertile and mountainous, while Togdheer is mostly semi-desert with little fertile greenery around. The Awdal region is also known for its offshore islands, coral reefs and mangroves. A scrub-covered, semi-desert plain referred as the Guban lies parallel to the Gulf of Aden littoral. With a width of twelve kilometres (7.5 miles) in the west to as little as two kilometres (1.2 miles) in the east, the plain is bisected by watercourses that are essentially beds of dry sand except during the rainy seasons. When the rains arrive, the Guban's low bushes and grass clumps transform into lush vegetation. This coastal strip is part of the Ethiopian xeric grasslands and shrublands ecoregion. Somaliland is located north of the Equator. It is semi-arid. The average daily temperatures range from 25 to 35 °C (77 to 95 °F). The sun passes vertically overhead twice a year, on 22 March and 23 September. Somaliland consists of three main topographic zones: (1). A Coastal Plain (Guban) (2) The Coastal Range (Oogo) (3) A Plateau (Hawd) The Coastal Plain (Guban) is a zone with high temperatures and low rainfall. Summer temperatures in the region easily average over 100 °F (38 °C). However, temperatures come down during the winter, and both human and livestock populations increase dramatically in the region. A shopping mall in downtown Burao. Map showing the distribution of the Afro-Asiatic Somali language in the Horn of Africa. The Habar Awal subclan of the Isaaq form the majority of the population living in both the northern and western portions of the Woqooyi Galbeed region, including the cities and towns of Northern Hargeisa, Berbera, Gabiley, Wajaale, Arabsiyo and Kalabaydh. The Habar Awal also have a strong presence in Northern Togdheer region as well, principally around the town of Sheikh and they also partially inhabit the city of Burao as well. 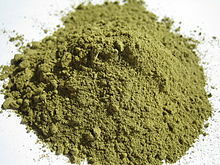 Henna powder is mixed with water and then applied on the hair. ^ Susan M. Hassig, Zawiah Abdul Latif, Somalia, (Marshall Cavendish: 2007), p.10. ^ website, Somallilandlaw.com - an independent non-for-profit. "Somaliland Constitution". www.somalilandlaw.com. Retrieved 2 July 2017. 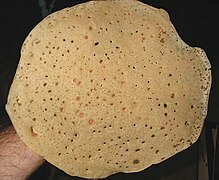 ^ a b "Somalia". World Factbook. Central Intelligence Agency. 14 May 2009. Retrieved 31 May 2009. ^ Paul Dickson, Labels for locals: what to call people from Abilene to Zimbabwe, (Merriam-Webster: 1997), p.175. ^ Lansford, Tom (24 March 2015). Political Handbook of the World 2015. CQ Press. ISBN 9781483371559. ^ "Population Estimation Survey 2014" (PDF). United Nations Population Fund. p. 103 (5 official regions). Retrieved 17 August 2017. ^ a b World Bank. Somalia Security and Justice Public Expenditure Review 2017. Accessed 24 April 2017. ^ a b c d Lacey, Marc (5 June 2006). "The Signs Say Somaliland, but the World Says Somalia". New York Times. Retrieved 2 February 2010. ^ "Analysis: Time for jaw-jaw, not war-war in Somaliland". Retrieved 28 March 2016. ^ "Somaliland Geography". Retrieved 28 March 2016. ^ a b "Somalia — Government". Library of Congress. Retrieved 15 February 2014. ^ a b c "The Constitution of the Republic of Somaliland" (PDF). Government of Somaliland. 1 May 2001. Archived from the original (PDF) on 27 February 2012. Retrieved 2 February 2010. ^ a b "Country Profile". Government of Somaliland. Retrieved 8 July 2012. ^ "De Facto Statehood? The Strange Case of Somaliland" (PDF). Yale University, Journal of International Affairs. 2008. Archived from the original (PDF) on 18 April 2010. Retrieved 2 February 2010. ^ Schoiswohl, Michael (2004). Status and (Human Rights) Obligations of Non-Recognized De Facto Regimes in International Law. University of Michigan: Martinus Nijhoff Publishers. p. 351. ISBN 978-90-04-13655-7. ^ "Regions and Territories: Somaliland". BBC News. 25 September 2009. Retrieved 2 February 2010. ^ "Chronology for Issaq in Somalia". Minorities at Risk Project. United Nations Refugee Agency. 2004. Retrieved 2 February 2010. ^ "Interview with Ambassador Brook Hailu Beshah". International Affairs Review. 8 November 2008. Retrieved 2 February 2010. ^ "Reforming Somaliland's Judiciary" (PDF). United Nations. 9 January 2006. Retrieved 2 February 2010. ^ "Arab League condemns Israel over Somaliland recognition". Ethjournal.com. 7 March 2010. Archived from the original on 21 June 2010. Retrieved 6 May 2010. ^ Peter Robertshaw (1990). A History of African Archaeology. J. Currey. p. 105. ISBN 978-0-435-08041-9. ^ Brandt, S. A. (1988). "Early Holocene Mortuary Practices and Hunter-Gatherer Adaptations in Southern Somalia". World Archaeology. 20 (1): 40–56. doi: 10.1080/00438243.1988.9980055. JSTOR 124524. PMID 16470993. ^ H. W. Seton-Karr (1909). "Prehistoric Implements From Somaliland". 9 (106). Man: 182–183. Retrieved 30 January 2011. ^ Bakano, Otto (24 April 2011). "Grotto galleries show early Somali life". Agence France-Presse. Archived from the original on 21 September 2013. Retrieved 11 May 2013. ^ Mire, Sada (2008). 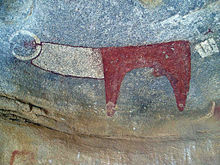 "The Discovery of Dhambalin Rock Art Site, Somaliland". African Archaeological Review. 25: 153–168. doi: 10.1007/s10437-008-9032-2. Archived from the original on 27 June 2013. Retrieved 22 June 2013. ^ Ali, Ismail Mohamed (1970). Somalia Today: General Information. Ministry of Information and National Guidance, Somali Democratic Republic. p. 295. ^ a b c Njoku, Raphael Chijioke (2013). The History of Somalia. ABC-CLIO. pp. 29–31. ISBN 0-313-37857-6. ^ Dalal, Roshen (2011). The Illustrated Timeline of the History of the World. The Rosen Publishing Group. p. 131. ISBN 1-4488-4797-4. ^ Sayed, Abdel Monem A. H. (2003). "The Land of Punt: Problems of the Archaeology of the Red Sea and the Southeastern Delta". In Hawass, Zahi A. (ed.). Egyptology at the Dawn of the Twenty-first Century: Archaeology. American Univ in Cairo Press. pp. 432–433. ISBN 977-424-674-8. ^ Dominy, Nathaniel J.; Ikram, Salima; Moritz, Gillian L.; Christensen, John N.; Wheatley, Patrick V.; Chipman, Jonathan W. "Mummified baboons clarify ancient Red Sea trade routes". American Association of Physical Anthropologists. Retrieved 18 June 2016. ^ Suzanne Richard (2003) Near Eastern archaeology: a reader, EISENBRAUNS, p. 120 ISBN 1-57506-083-3. ^ Warmington 1995, p. 54. ^ a b Warmington 1995, p. 229. ^ Warmington 1995, p. 187. ^ Warmington 1995, pp. 185–6. ^ Lewis, I.M. (1955). Peoples of the Horn of Africa: Somali, Afar and Saho. International African Institute. p. 140. ^ Omar, Mohamed Osman (1 January 2001). 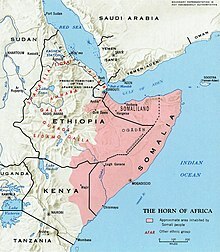 The scramble in the Horn of Africa: history of Somalia, 1827-1977. Somali Publications. ^ Baker, Anne (2003). From Biplane to Spitfire. Pen And Sword Books. pp. 161–162. ISBN 0-85052-980-8. ^ a b "Somali Independence Week - Roobdoon Forum June 21, 2009". Archived from the original on 28 September 2011. Retrieved 25 January 2011. ^ Cahoon, Ben. "Somalia". www.worldstatesmen.org. ^ Kaplan, Seth (July 2008). "The Remarkable Story of Somaliland" (PDF). Journal of Democracy. 19: 257. Retrieved 6 August 2017. ^ "The making of a Somalia state". Strategy page.com. 9 August 2006. Retrieved 25 February 2009. ^ Compagnon, Daniel (22 October 2013). "State-sponsored violence and conflict under Mahamed Siyad Barre: the emergence of path dependent patterns of violence". World Peace Foundation, The Fletcher School of Law and Diplomacy. Retrieved 7 October 2014. ^ "Analysis: Somalia's powerbrokers". BBC News. 8 January 2002. Retrieved 7 October 2014. ^ Abou Jeng (2012). Peacebuilding in the African Union: Law, Philosophy and Practice. Cambridge University Press. p. 245. ISBN 978-1-107-01521-0. ^ Marleen Renders (2012). Consider Somaliland: State-Building with Traditional Leaders and Institutions. BRILL Academic. pp. 59–60. ISBN 978-90-04-21848-2. ^ Ingiriis, Mohamed Haji (2 July 2016). ""We Swallowed the State as the State Swallowed Us": The Genesis, Genealogies, and Geographies of Genocides in Somalia". African Security. 9 (3): 237–258. doi: 10.1080/19392206.2016.1208475. ISSN 1939-2206. ^ Mullin, Chris (1 October 2010). A View From The Foothills: The Diaries of Chris Mullin. Profile Books. ISBN 978-1847651860. ^ Mburu, Chris; Rights, United Nations Office of the High Commissioner for Human; Office, United Nations Development Programme Somalia Country (1 January 2002). Past human rights abuses in Somalia: report of a preliminary study conducted for the United Nations (OHCHR/UNDP-Somalia). s.n. ^ Peifer, Douglas C. (1 May 2009). Stopping Mass Killings in Africa: Genocide, Airpower, and Intervention. DIANE Publishing. ISBN 9781437912814. ^ Straus, Scott (24 March 2015). Making and Unmaking Nations: The Origins and Dynamics of Genocide in Contemporary Africa. Cornell University Press. ISBN 9780801455674. ^ Jones, Adam (22 January 2017). Genocide, war crimes and the West: history and complicity. Zed Books. ISBN 9781842771914. ^ "Investigating genocide in Somaliland". ^ Tekle, Amare (1 January 1994). Eritrea and Ethiopia: From Conflict to Cooperation. The Red Sea Press. ISBN 9780932415974. ^ "Conflict in Somalia: Drivers and Dynamics" (PDF): 10. ^ Press, Robert M. (1 January 1999). The New Africa: Dispatches from a Changing Continent. University Press of Florida. ISBN 9780813017044. ^ Lindley, Anna (15 January 2013). The Early Morning Phonecall: Somali Refugees' Remittances. Berghahn Books. ISBN 9781782383284. ^ Gajraj, Priya (2005). Conflict in Somalia: Drivers and Dynamics (PDF). World Bank. p. 10. ^ Law, Ian (1 January 2010). Racism and Ethnicity: Global Debates, Dilemmas, Directions. Longman. ISBN 9781405859127. ^ "Africa Watch". Volume 5: 4. 1993. ^ de Waal, Alex; Meierhenrich, Jens; Conley-Zilkic, Bridget (2012). "How Mass Atrocities End: An Evidence-Based Counter-Narrative". Fetcher Forum of World Affairs. 36 (1): 15–31. ^ Mohamed Haji Ingiriis (2016). The Suicidal State in Somalia: The Rise and Fall of the Siad Barre Regime, 1969–1991. University Press of America. pp. 236–239. ISBN 978-0-7618-6720-3. ^ Rebecca Richards (2016). Understanding Statebuilding: Traditional Governance and the Modern State in Somaliland. Routledge. pp. 98–100 with footnotes. ISBN 978-1-317-00466-0. ^ Somaliland: Democratisation and Its Discontents. International Crisis Group. 2003. p. 6. Retrieved 15 May 2017. ^ a b c "Somaliland's Quest for International Recognition and the HBM-SSC Factor". Archived from the original on 28 May 2012. ^ "Somaliland Constitution". Retrieved 28 March 2016. ^ Human Rights Watch (Organization), Chris Albin-Lackey, Hostages to peace: threats to human rights and democracy in Somaliland, (Human Rights Watch: 2009), p.13. ^ "Somalia: Somaliland appeals for 'cooperation with Puntland' a second time". Archived from the original on 31 January 2014. ^ "Somaliland * - Country report - Freedom in the World - 2017". freedomhouse.org. ^ Kaplan, Seth (July 2008). "The Remarkable Story of Somaliland" (PDF). Journal of Democracy. 19: 248 & 252. Retrieved 6 August 2017. The Republic of Somaliland, the secessionist northwestern slice of Somalia that declared independence in 1991, has a far better democratic track record than any of its neighbors despite—or, perhaps, because of—a dearth of assistance from the international community.[...] Whereas attempts to build stable state structures in Mogadishu have mostly been top-down, with outsiders in the lead, Somaliland has constructed a functioning government from the bottom up, on its own, with little outside assistance. ^ Kaplan, Seth (July 2008). "The Remarkable Story of Somaliland" (PDF). Journal of Democracy. 19: 248–249 & 253. Retrieved 6 August 2017. Abutting the Gulf of Aden just south of the Red Sea, across the water from Yemen and Saudi Arabia, and bordered by Ethiopia and the rest of Somalia, this strategically important territory is not even recognized by the international community but undoubtedly has the most democratic political system in the entire Horn of Africa. 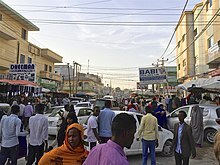 In contrast to the chaos and extremist threats that continue to plague much of the rest of Somalia—and unlike the authoritarian regimes that throng its neighborhood—Somaliland has held three consecutive competitive elections since its constitutional referendum in 2001, has a parliament controlled by opposition parties, and boasts a vibrant economy dominated by the private sector. Somaliland has achieved these successes by constructing a set of governing bodies rooted in traditional Somali concepts of governance by consultation and consent. In contrast to most postcolonial states in Africa and the Middle East, Somaliland has had a chance to administer itself using customary norms, values, and relationships. In fact, its integration of traditional ways of governance within a modern state apparatus has helped it to achieve greater cohesion and legitimacy and— not coincidentally—create greater room for competitive elections and public criticism than exists in most similarly endowed territories.[...] Somaliland has profited from a unity conferred by its comparatively homogeneous population, modest disparities in personal wealth, wide- spread fear of the south, and a lack of outside interference that might have undermined the accountability that has been forced on its leaders. This cohesiveness—which makes Somaliland sharply distinct from both Somalia and most other African states—has combined with the enduring strength of traditional institutions of self-governance to mold a unique form of democracy. ^ a b Gettleman, Jeffrey (7 March 2007). "Somaliland is an overlooked African success story". The New York Times. Retrieved 27 July 2012. ^ a b c "Somaliland Government". The Somaliland Government. Retrieved 28 July 2012. ^ "Somaliland Cabinet". The Somaliland Government. Retrieved 28 July 2012. ^ "Opposition leader elected Somaliland president". Google News. AFP. Retrieved 1 July 2010. ^ "Bashe Mohamed Farah elected Speaker of Somaliland's House of Representatives". The National Somaliland. Retrieved 13 November 2017. ^ "Somaliland Parliament". Retrieved 28 March 2016. ^ "Somaliland Judicial System". Retrieved 28 March 2016. ^ Manby, B. (2012). Citizenship Law in Africa: A Comparative Study. Open Society Foundations. p. 46. ISBN 978-1-936133-29-1. Retrieved 2 August 2016. ^ website, Somallilandlaw.com - an independent non-for-profit. "Somaliland Political Parties Law". www.somalilandlaw.com. Retrieved 30 June 2017. ^ a b "Somaliland closer to recognition by Ethiopia". Afrol News. Retrieved 19 October 2014. ^ "Somaliland, Djibouti in bitter port feud". afrol News. Retrieved 22 July 2007. ^ "Somaliland Diplomatic Mission in Sweden". Archived from the original on 10 May 2009. Retrieved 2 April 2010. ^ "Somaliland". United Kingdom Parliament. 4 February 2004. Retrieved 23 July 2007. ^ "Somaliland and Liberland sign Memorandum of Understanding". LiberlandPress.com. 26 September 2017. Retrieved 28 October 2017. ^ "EU Breaks Ice on Financing Somaliland". Global Policy Forum. 11 February 2003. Retrieved 23 February 2007. ^ "AU supports Somali split". Mail and Guardian Online. 10 February 2006. Retrieved 23 February 2007. ^ Shipton, Martin (3 March 2006). "Wales strikes out on its own in its recognition of Somaliland". Wales Online. Retrieved 25 June 2010. ^ "Somaliland on verge of observer status in the Commonwealth". Qaran News. 16 November 2009. Retrieved 2 February 2010. ^ Ibrahim, Mohamed; Gettleman, Jeffrey (26 September 2010). "Helicopter Attacks Militant Meeting in Somalia". The New York Times. ^ "afrol News – US near de-facto recognition of Somaliland". Retrieved 28 March 2016. ^ "Strengthening the UK's relationship with Somaliland". Ukun.fco.gov.uk. 25 November 2010. Archived from the original on 7 August 2011. Retrieved 29 March 2011. ^ "Ahmed Mahamoud Silanyo, President of the Republic of Somaliland – This is Africa". Thisisafricaonline.com. 20 January 2011. Archived from the original on 30 January 2011. Retrieved 29 March 2011. ^ "UKIP supports Somaliland national day". UKIP. Retrieved 28 March 2016. ^ Report of the Secretary-General on specialized anti-piracy courts in Somalia and other States in the region: "The Government of Seychelles has entered into an agreement with the Transitional Federal Government, and memorandums of understanding with the authorities of "Puntland" and "Somaliland", for the transfer of convicted persons to prisons in "Puntland" and "Somaliland". As set out in the section above concerning Somalia, each proposed transfer under these arrangements requires a request to be made by the Seychelles authorities and the agreement of the relevant Somali authorities." ^ "Awdal "Republic": Declaration of Independence, Somalia". University of Pennsylvania. Retrieved 29 January 2007. ^ "Somaliland: The Myth of Clan-Based Statehood". Somalia Watch. 7 December 2002. Archived from the original on 15 June 2006. Retrieved 29 January 2007. ^ "Puntland and Somaliland clashing in northern Somalia". Hoehne, Markus. 7 November 2007. Retrieved 2 December 2007. ^ "Mimesis and mimicry in dynamics of state and identity formation in northern Somalia". Hoehne, Markus. 2009. Retrieved 2 October 2009. ^ "Somaliland Defence Forces take control of Las Qorey". Qaran News. 9 July 2008. Retrieved 2 April 2010. ^ "Somalia". Retrieved 28 March 2016. ^ "What is Khatumo State?". Somalia Report. 26 April 2012. Archived from the original on 12 March 2014. Retrieved 14 April 2015. ^ "賃貸情報収集術〜目先の利点に騙されない〜". Archived from the original on 4 March 2016. Retrieved 28 March 2016. ^ "The Declaration of Adal State". Archived from the original on 16 February 2011. ^ Houreld, Katharine (4 April 2011). "Somaliland coast guard tries to prevent piracy". NavyTimes. Gannett Government Media Corporation. Retrieved 27 January 2013. ^ Hussein, Abdi (13 August 2011). "Somaliland's Military is a Shadow of the Past". Somalia Report. Somalia Report. Archived from the original on 20 January 2013. Retrieved 27 January 2013. ^ http://www.actionaid.org ActionAid International Somaliland (AAIS) supports poor and marginalised communities in three of six Somaliland administrative regions. ^ "Somaliland in Figures" (PDF). ^ "Climate of Somalia" (PDF). Food and Agriculture Organization. pp. 69–73. Archived from the original (PDF) on 4 November 2016. Retrieved 4 November 2016. ^ "Long term mean monthly sunshine fraction in Somalia". Food and Agriculture Organization. Archived from the original on 5 October 2016. Retrieved 4 November 2016. ^ "Klimatafel von Hargeisa / Somalia" (PDF). Baseline climate means (1961-1990) from stations all over the world (in German). Deutscher Wetterdienst. Retrieved 4 November 2016. ^ "Appendix I: Meteorological Data" (PDF). Springer. Retrieved 22 October 2016. ^ "Klimatafel von Berbera / Somalia" (PDF). Baseline climate means (1961-1990) from stations all over the world (in German). Deutscher Wetterdienst. Retrieved 22 October 2016. ^ "Long term mean monthly sunshine fraction in Somalia". Food and Agriculture Organization. Archived from the original on 5 October 2016. Retrieved 4 November 2011. ^ "Weatherbase: Historical Weather for Burao, Somalia". Weatherbase. 2011. Retrieved 24 November 2011. ^ "Climate: Burao, Somalia". Climate-Data.org. 2013. Retrieved 28 December 2013. ^ "Land Resources Assessment of Somalia" (PDF). Somalia Water and Land Information Management Project. June 2009. p. 10. Archived from the original (PDF) on 5 October 2013. Retrieved 1 October 2013. ^ "Klimatafel von Erigavo / Somalia" (PDF). Baseline climate means (1961-1990) from stations all over the world (in German). Deutscher Wetterdienst. Retrieved 4 November 2016. ^ "Somaliland hope". BBC News. 26 January 2011. Retrieved 13 May 2012. ^ "Golis Telecom Somalia Profile". Golis Telecom website. Archived from the original on 22 October 2007. Retrieved 17 December 2007. ^ "Somalia calling; Mobile phones. (Golis Telecom Somalia)". Economist. 20 December 2005. Retrieved 20 December 2005. ^ Bakano, Otto (24 April 2011). "Grotto galleries show early Somali life". AFP. Retrieved 13 March 2013. ^ "Onshore Somaliland Mesozoic Rift Play SL10B/13 & Odewayne Licences" (PDF). Genel Energy. Retrieved 3 August 2017. ^ "Somaliland Republic : Country Profile". 2 March 2001. Archived from the original on 2 March 2001. ^ "A software tool for research in linguistics and lexicography: Application to Somali". Computers and Translation. 2: 21–36. doi: 10.1007/BF01540131. Retrieved 28 March 2016. ^ I. M. Lewis, Saints and Somalis: popular Islam in a clan-based society, (The Red Sea Press: 1998), p.11. ^ "Somaliland: Going it alone". The Economist. 17 October 2015. Retrieved 18 October 2015. ^ Charles George Herbermann, The Catholic encyclopedia: an international work of reference on the constitution, doctrine, discipline, and history of the Catholic church, Volume 14, (Robert Appleton company: 1913), p.139. ^ Herbermann, Charles, ed. (1913). "Somaliland" . Catholic Encyclopedia. New York: Robert Appleton Company. ^ "Diocese of Mogadishu, Somalia". Retrieved 28 March 2016. ^ "Global Mission's Top 10 Places to Pray for – REGION: NORTH Africa – Somalia". Archived from the original on 1 October 2011. ^ a b c d e f g h i j k "Somalia Population Survey" (PDF). ^ Wiafe-Amoako, Francis (2015). Africa 2015-2016. p. 236. ISBN 1475818696. ^ Somaliland: With Addis Ababa & Eastern Ethiopia By Philip Briggs. Google Books. ^ Research Directorate, Immigration & Refugee Board, Canada (1 September 1996). "Somaliland: Information on the current situation of the Isaaq clan and on the areas in which they live". Immigration and Refugee Board of Canada. SML24647.E. Archived from the original on 19 October 2013. Retrieved 27 August 2015. ^ Vries, F. W. T. Penning de (1 January 2005). Bright spots demonstrate community successes in African agriculture. IWMI. p. 67. ISBN 9789290906186. Gadabursi, the second largest clan in Somaliland, was peacefully elected as president. ^ Refugees, United Nations High Commissioner for. "Refworld | Report on the Fact-finding Mission to Somalia and Kenya (27 October - 7 November 1997)". Refworld. Retrieved 17 November 2017. ^ "Report on the Fact-finding Mission to Somalia and Kenya". Danish Immigration Service: 7. Retrieved 16 November 2017. ^ Samatar, Abdi I. (2001) "Somali Reconstruction and Local Initiative: Amoud University," Bildhaan: An International Journal of Somali Studies: Vol. 1, Article 9, p. 132. ^ Dostal, Walter; Kraus, Wolfgang (22 April 2005). Shattering Tradition: Custom, Law and the Individual in the Muslim Mediterranean. I.B.Tauris. p. 296. ISBN 9780857716774. This article incorporates text from a publication now in the public domain: Herbermann, Charles, ed. (1913). "Somaliland" . Catholic Encyclopedia. New York: Robert Appleton. Hoehne, Markus V. 2009: Mimesis and mimicry in dynamics of state and identity formation in northern Somalia, Africa 79/2, pp. 252–281. "As Somalia Struggles, Can Neighboring Somaliland Become East Africa's Next Big Commercial Hub?". International Business Times. 18 September 2013. Retrieved 23 April 2019. Warmington, Eric Herbert (1995). The Commerce Between the Roman Empire and India. South Asia Books. ISBN 81-215-0670-0. Wikivoyage has a travel guide for Somaliland. 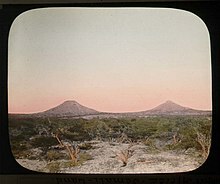 Wikimedia Commons has media related to Somaliland.